You know what? I have absolutely nothing to write about today. How long have I been sitting here, trying to think of something, anything, to go along with this recipe? I don’t know. This morning we did the usual getting-ready-for-school rush. It was pouring with rain. We were late to school, as usual. Everyone was soaked. My little guy and I got home, got dry and petted our cat. I put some clothes in the washer, my little guy played with some toys. I looked at FoodGawker, then put a cake in the oven. The rain has made it too dark to color , so I decided to write about this recipe. Now I’m sitting here, staring at the rain outside and wondering what on Earth would be interesting enough to write about. Well. Clearly, I have nothing interesting going on at the moment. I picked up the latest Donna Hay magazine the other day and had a flick through. At first glance, one recipe really stood out at me. Salted burnt honey sauce. Wow. That sounded interesting. And delicious. So I made it. Then I had a jar of salted burnt honey sauce that tasted incredible, but nothing to put it on. The next day, I thought of something. French toast with ice cream and the salted burnt honey sauce drizzled all over it. Perfect! I got to work on this idea, getting all the utensils and pans out to make this recipe. But as I went along, I decided to embellish it a little. Inspired by a Cook’s Illustrated recipe, I’d perhaps add some pecans. And what about the rum that I hadn’t used since I made rum & tonka bean dark chocolate truffles? Delicious! Once I had the toast finished, I also arranged some banana slices on top, added a scoop of vanilla ice cream and then drizzled over the salted burnt honey sauce. Yep. This was exactly where I wanted this recipe to go. How’s this for interesting! When I posted a photo of this dish on my Instagram feed, I didn’t expect it to become one of the most-liked out of my 1500+ photos! That has just got to say something about how interesting this recipe is. What are your favorite French toast toppings? 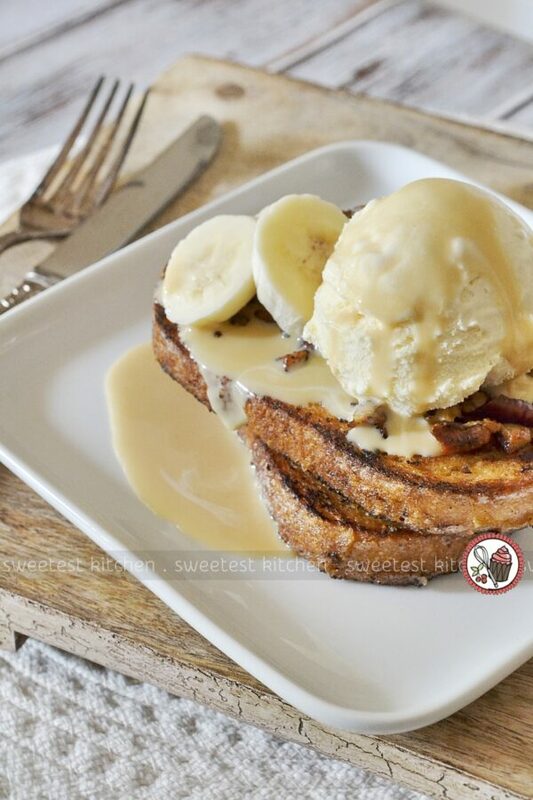 A delicious gourmet-style rum and pecan French toast with a salty sweet burnt honey sauce. For salted burnt honey sauce: Place honey in a medium saucepan over high heat and cook for 2-3 minutes or until dark golden brown. Add sweetened condensed milk and cream (be careful, as it may bubble up and spit), whisking well, and bring to the boil. Reduce heat to medium and cook, whisking constantly, for 6-8 minutes or until thickened. Add sea salt flakes and whisk to combine. Store leftover sauce in refrigerator for 2 weeks - warm and whisk well before serving. 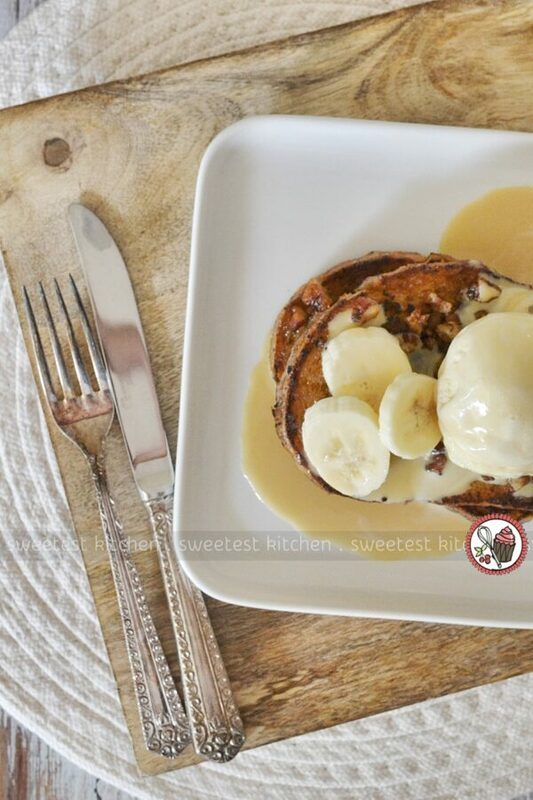 For French toast: Place pecans, ½ tablespoon brown sugar and ¼ teaspoon cinnamon in a small food processor and pulse until pecans are chopped to between coarsely-finely ground. Alternatively, chop the pecans with a knife, then place in a bowl and stir in the sugar and cinnamon. Set aside. In a bowl, whisk together milk, rum, yolks, the remaining 1½ tablespoons brown sugar, 1 tablespoon butter, vanilla, the remaining ¼ teaspoon cinnamon, nutmeg and salt until well blended. Transfer mixture to a shallow dish, such as a pie dish. Soak bread slices in the milk mixture for about 20 seconds per side. Place slices in a single layer on a baking sheet until ready to cook. Melt ½ tablespoon of the extra butter in a 12-inch frying pan over medium-low heat. Place 2 slices of the soaked bread in the hot pan and cook until golden brown, about 4 minutes. Flip the bread over and cook until golden brown, about another 4 minutes. Remove from the pan and set aside (place on a baking sheet in a 110C oven to keep warm, optional). Give the bottom of the pan a quick wipe out with a kitchen towel and repeat the cooking process with the another ½ tablespoon of butter and 2 slices of bread. Give the pan another wipe out with the towel, and melt the last ½ tablespoon butter in the pan. Toss in the chopped pecan mixture and toast until lightly golden. Remove from the pan. Sprinkle ½-1 tablespoon of the toasted pecans on top of each slice of warm toast. Place 2 slices of toast on 2 serving plates. 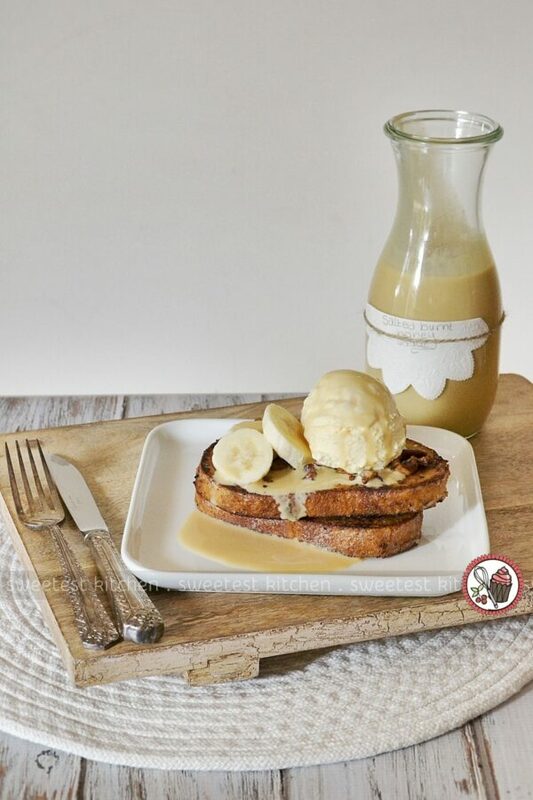 Top with slices of banana, a scoop of vanilla ice cream, and a good drizzle of salted burnt honey sauce (warm the sauce before drizzling if you have time). If any leftover toasted pecans, feel free to sprinkle them on top as well. Serve immediately. I wouldn’t mind starting my day with this french toast. That salted burnt honey sauce is calling my name! 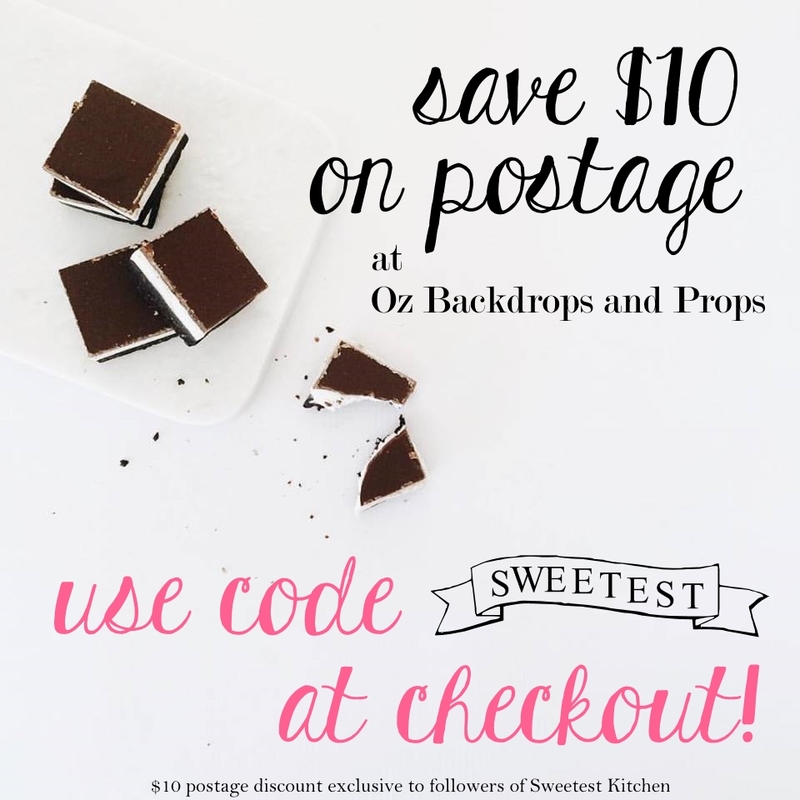 You had me at everything! 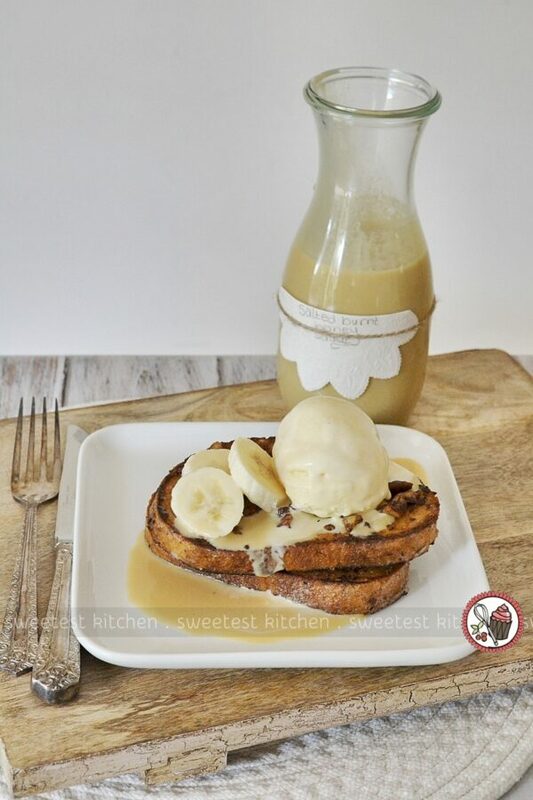 French toast to start the day would be perfect! And the salted burnt honey will make it even better!